The SJV Uniform Shop is located next to the Year 5/6 St Joseph classroom in the senior wing of the school. New and good quality second hand items are available. All items and the pricelist can be found below or on the SJV Qkr! app. Preferred method of payment is Qkr! but we do accept cash and credit card. We request that all donated items be clean and in good condition. They can be left at the Front Office or the basket outisde the Uniform shop anytime or dropped in at the Uniform Shop when open. Please ensure they are in a clean plastic bag - Thank you. 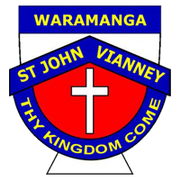 We are proud that St John Vianney's School Uniform is part of our community identity. Our students are required to be in uniform at all times, except on your their birthdays when they can celebrate in free dress and when Year 6's are permitted to wear their red Year 6 shirts.